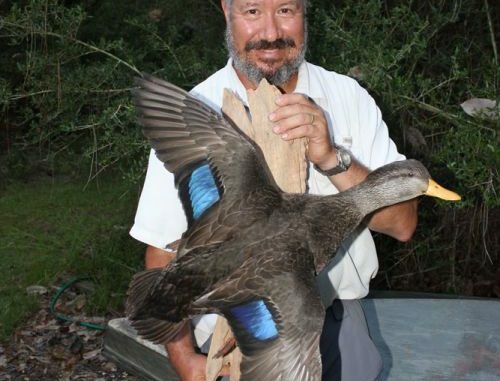 A trophy that any duck hunter would prize: Tony Cyprus with a one-of-a-kind South Louisiana black duck. A true black duck — not what lots of area hunters call a mottled — is definitely a South Louisiana wallhanger. Learn how to tell the difference — and also tips that will help your taxidermist if you shoot a trophy this season. 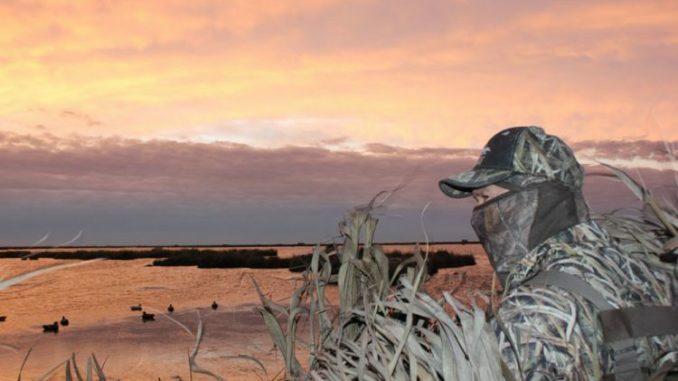 But in South Louisiana, Mother Nature still sends an immense variety of birds — and every hunter hopes for an opportunity at one of those rarely seen exotic ducks. Everyone has heard about “that guy” who shot a cinnamon teal, or has seen that aging goldeneye mount that was taken 30 years ago in a marsh that’s now underwater. There’s little doubt, however, that if you are lucky enough to hit the exotic waterfowl lottery, the bird’s headed to your favorite taxidermist and is going on the wall. But as rare as they might be, a lot of hunters would say a black duck just isn’t quite exotic enough — mainly because all duck hunters have killed one (or so they believe). In classic Louisiana fashion, we’ve got a dozen different names for the same thing. Whether you learned to call it a black duck, a black mallard, a summer mallard, a mottled duck or a French duck, the reality is that hunters are probably talking about as many as three species that all appear very similar. So it stands to reason that a Yankee bird that usually resides in New England and has half a dozen aliases often gets confused with its mottled Cajun cousin. But, as Tony Cyprus Jr. can attest, a true, real-deal, olive-billed, red-legged black duck is absolutely a South Louisiana exotic — and it’s most certainly a wallhanger. Late season skies may be a bit empty, but to an old diehard that means scanning the horizon just that much harder. Nick Sicomo and Josh Gerard sat together in Cyprus’ Southfork flatboat dubbed “The Mothership,” begrudging the southerly flow producing less than ideal second-split hunting conditions. “We ought to go solo this morning,” Cyprus said, looking for consensus as he killed the motor. “Tony, you going to take the Honey Hole?” Gerard asked with hopeful inquisitiveness. “Well, looks like it’s going to be Plan B for me,” he said. The group paddled off into the morning darkness, each hunter taking a separate trenasse to gain access to the interior of the Big Branch Marsh National Wildlife Refuge. The rest of the public-land army was in the lake, already scanning the marsh with their Q-beams. But these three diehards wanted to put some distance between them. Hunting 500 to 600 yards apart, the trio traded pin drops of each other’s locations to ensure they wouldn’t be flaring each other’s working birds. Naturally, Sicomo in the Honey Hole was getting plenty of action. He was getting good looks from greys, and he managed to bag a few for good measure. Over at “Plan B,” Cyprus lit up when he saw the first four birds of the morning working in his direction. Two quickly peeled off, but the other pair made a beeline for his pond. Tony took the first opportunity they gave him. 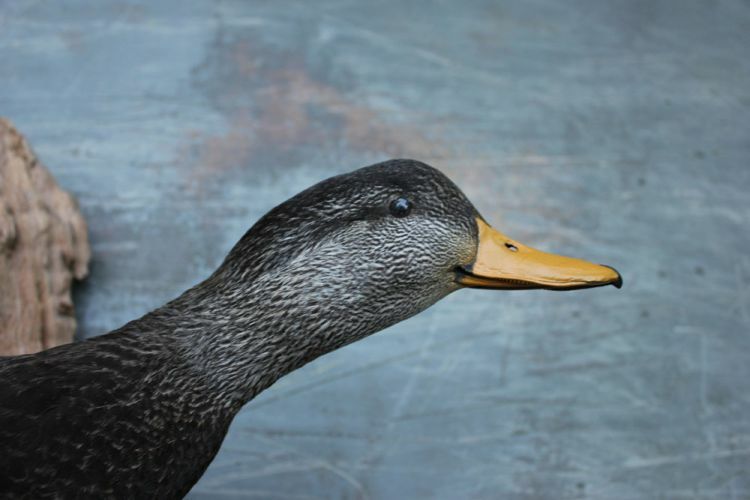 The dark shade of a black duck’s body feathers creates a distinctive transition from the lighter plumage of the bird’s head, neck and throat; another subtle difference from Louisiana’s mottled duck. But when he finally got his pirogue to the bird, he immediately knew something was different: This duck wasn’t from Dixie. After the hunt, Cyprus made it back to find Sicomo and Gerard waiting on him. “No way this is what I think it is,” Cyprus said rhetorically, with the bird making a thud when he dropped it in Sicomo’s pirogue. Tony told how he though the flight of four was made up of huge mottleds coming in from the lake. “Two landed in the bay in front of me, and the other two just kept coming in low, like missiles,” he said, his outstretched arms imitating cupping duck wings. “Did you call? I only heard one shot from your direction,” Gerard said. The hunter said he didn’t pick up a call. “I was too weak in the knees to call, and they didn’t work my decoys, either,” Cyprus said. “They were coming down about 45 yards away, and I took the only shot I had. Gerard picked up the bird in disbelief. Sicomo, a longtime hunter, added more certainty to the identification. Now for the ol’ schoolers out there already muttering, “Yeah, yeah, it’s just another dark summer mallard,” world champion taxidermist Kevin Hynes actually mounted the bird — and left no room for doubt on the ID. “It’s 100 percent real black duck,” Hynes said. “And I know my ducks. I’ve mounted several blacks over the years, and they’re usually taken by guys hunting east of Louisiana. I did one last year for a guy who had taken it on a guided hunt somewhere up the East Coast — Maryland, I think. Although there are plenty of look-a-likes and about twice as many nicknames for black ducks, Cyprus can tell you that the nom de plume “black duck” isn’t just another Louisiana handle for our local mottled. Blacks are a legitimate out-of-town exotic, so if you’re on the hunt for that rarely bagged bird and carry a horseshoe in your shell bucket, pay close attention to that pair of late-season mottleds: You just might get a shot at a trophy black instead. Tony shows off a nice mature drake grey duck. 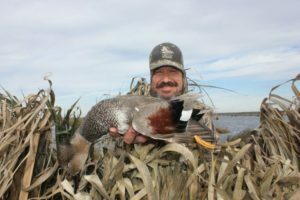 Late season birds like this have feathered out and are much better choices if you are considering a duck for the wall. Mud boats just aren’t an option on Big Branch Marsh National Wildlife Refuge. But that’s of little concern to a seasoned old timer who regularly hunts the refuge with an original Ron Chapman pirogue. “Mandevillian,” as Tony Cyprus Jr. goes by on the LouisianSportsman.com forum, regularly posts about his exploits in the marshes north of Lake Pontchartrain. And Cyprus’ response to being asked to share some advice on those exploits was classic public land hunter. But he said the key to his consistent public-land success is pretty straightforward. He works hard at doing both, and his most effective tool is that antique Chapman. The hunter, along with his group of diehards, usually end up hunting about half a mile from a tree line that’s a natural ridge separating the marsh from high ground. 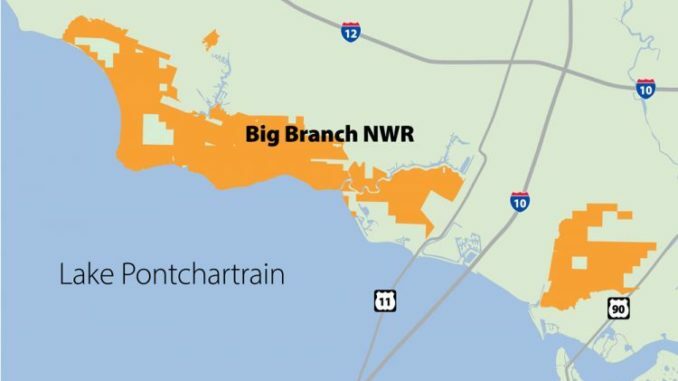 It runs throughout Big Branch — from Slidell to Mandeville — parallel to Lake Pontchartrain. This approach is definitely not for the lazy hunter. “It can take some work to get back there,” Cyprus said. The secret to Tony’s success is using large palmetto fronds to completely conceal his Ron Chapman pirogue tucked into the broken marsh edge. The interlocking frond edges look just like the top marsh grass. 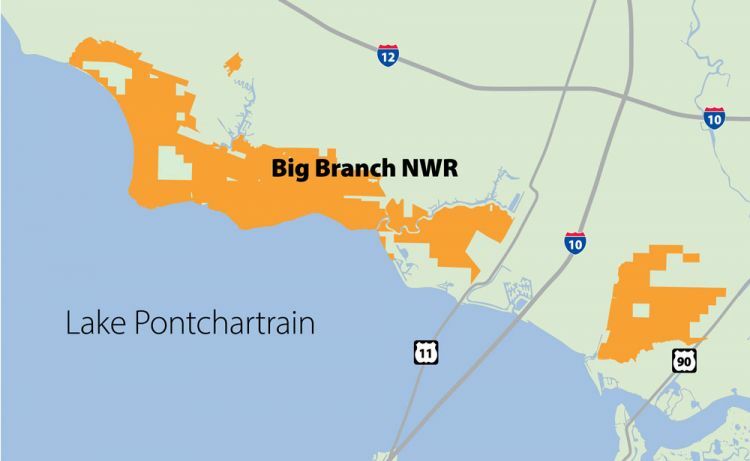 Given its proximity to the New Orleans and Baton Rouge metro areas, Big Branch gets plenty of attention from hunters, as well as ducks. He also will be the first to tell you that if you’re not well hidden, the spot you end up hunting won’t matter much. Cyprus has a passion for creating unbelievable camo concealment, and the product he creates is something Delta Force would envy. Most duck hunters have used palmettos to camouflage their blinds, but Cyprus has a go-to stash of giant palmetto fronds that he uses to completely encase his pirogue. “I make like a palmetto teepee around my Chapman and get it tucked into the broken edges of the pond,” he explained. 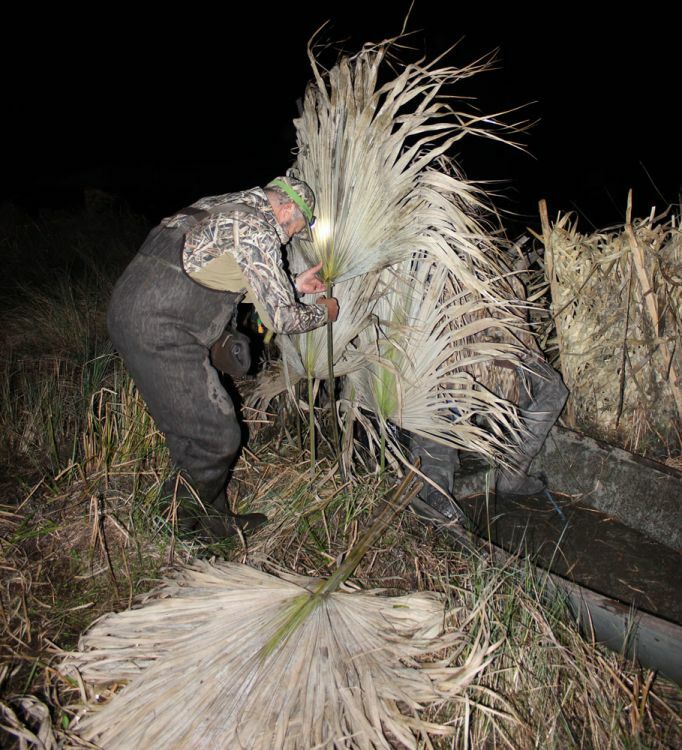 “I painstakingly make the tops of the fronds interlock to create a kind of goose pit blind in the marsh. The palmettos also provide a secondary benefit: The palm stalks act like stakes to lock his pirogue in place. “That lets me stay seated while I’m swinging around and when I’m shooting,” Cyprus said. His two-pronged approach provides him with plenty of action to keep him returning to Big Branch. “I’m a good ways off from the pressure around Lake Pontchartrain, and my blind has a really low profile that blends into the marsh so those inquiring eyes of greys won’t see anything out of the ordinary,” Cyprus said. Anyone planning to hunt Big Branch Marsh National Wildlife Refuge should read the regulations before heading out, Tony Cyprus Jr. said. Hunting has to end by noon, and dekes and blinds have to be rounded up by 1 p.m.
And Big Branch is also closed on Mondays, Tuesdays and Fridays to give ducks a rest and, hopefully, get them to stick around a little longer. Cyprus also cautioned against hunting without the refuge permit, as hunters are checked regularly — noting he’s a fan of the scrutiny. The almost absence of brown highlights on a black duck’s shoulder feathers give the bird a much darker appearance than our resident mottled duck. 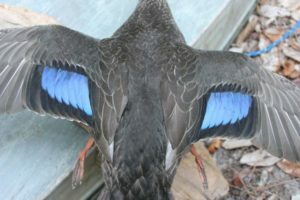 In contrast to the black duck, the shoulder feathers of mottled ducks have a clearly defined thick brown edging, nearly as wide as a highlighter tip. Given the name, hunters tend to assume the color of the bird is the best way to confirm its species; it’s obviously called a black duck for a reason, right? 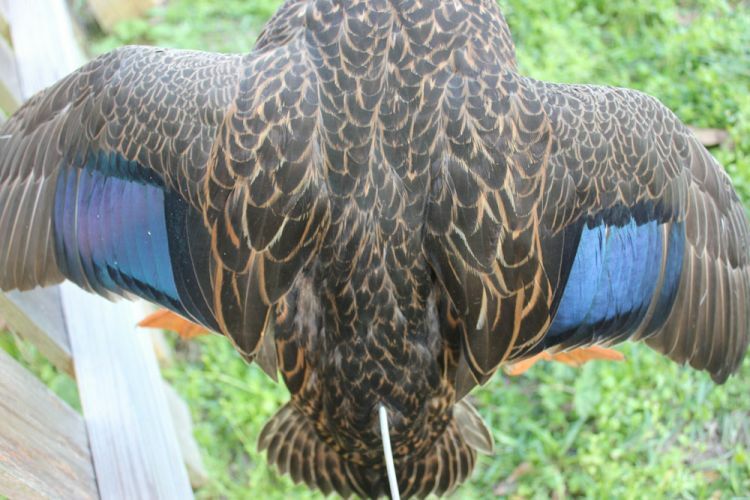 But despite its name, hunters may not find the black feathers they are expecting to see. 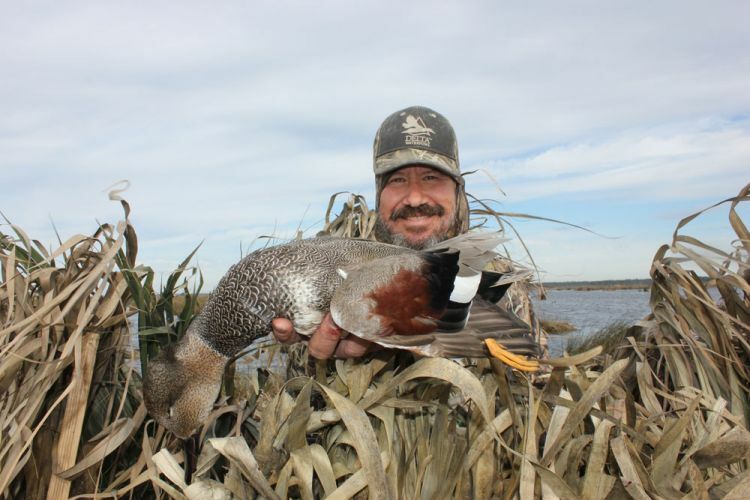 According to Paul Link, North American Waterfowl Management Plan Coordinator with the Louisiana Department of Wildlife & Fisheries, “There really aren’t many good/easy distinguishing features between them (black ducks) and mottled ducks. When you have the benefit of side-by-side comparisons of known species, hunters can more easily see what Link is referring to. The tan edging of the black’s feathers is more similar to a pinstripe when compared to a mottled’s tan edging, which is broader. Therefore, the black duck’s dark appearance is not due to black feathers per se, but rather the reduction of the thickness of tan edging on the black’s body feathers. “There are some more subtle differences in the throat, neck, and facial markings, but they are even less conspicuous,” Link said. Another ID technique has nothing to do with the duck — where hunters take the bird is nearly as useful as the actual bird itself. 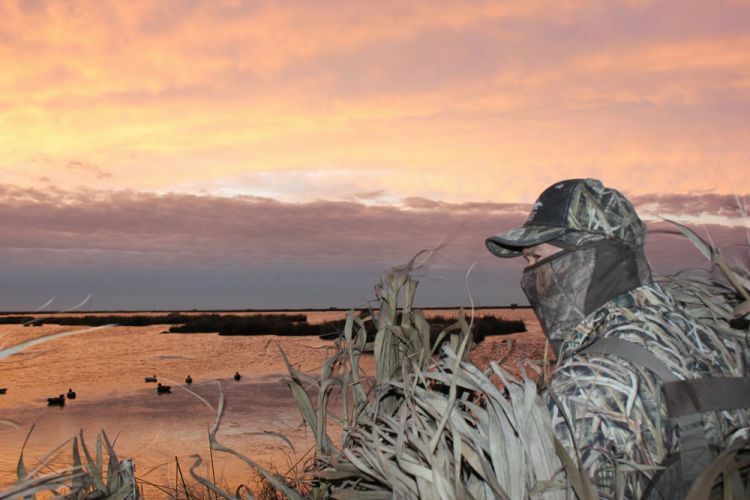 It shouldn’t come as any surprise to local duck hunters that Louisiana is not a likely black duck recovery location. In the 2014-15 season, 276 blacks were taken compared to nearly 29,000 mottleds. The percentage ratio held nearly the same for the 2015-16 season, when 154 blacks were taken compared to almost 14,000 mottleds. In a state known for its hospitality, the black duck’s Cajun cousin doesn’t exactly fill that bill. That’s probably because mottleds don’t like to associate with any out-of-town ducks, regardless of similarities. Link theorized that there might be a valid reason for the mottleds’ shyness. With this process repeating itself in big duck season, it’s of little wonder why local mottleds are decoy and call shy — they’re basically freaked out by all the tourists. So on your next hunt, unless you find yourself on the East Coast, when you pick up that dark mottled duck give it a skeptical eye. Take a close look at the thickness of the tan edging on the bird’s body feathers. Editor’s note: Hynes can be reached at 985-863-0040, or through his website at taxidermybykevinhynes.com.